BBC Store to close in November | What Hi-Fi? The BBC is closing its digital download store, less than two years after it opened. A BBC Store spokesperson told the BBC that demand had not been as strong as the corporation had hoped, and that it didn't "make sense" to invest in it further. 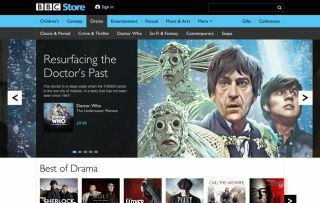 BBC Store launched as an extension of the BBC's iPlayer catch-up and on-demand service. But instead of offering shows free to stream or download and keep for up to 30 days before they expire, BBC Store let users buy digital copies of shows for a one-off fee. They could then keep the shows in perpetuity. The selection included a mix of new shows such as Peter Kay's Car Share and classic fare such as Fawlty Towers. This isn't the end of the line for classic BBC shows though. According to a statement on the BBC Store website, the Beeb will "continue to find new ways of making BBC archive content available." The message added: "We do hope you enjoyed discovering some wonderful programmes, old and new!" The closure is likely due to competition from streaming services Netflix and Amazon Prime Video. Both offer BBC shows such as Doctor Who and Sherlock included in their monthly subscription fee. As such, people were unlikely to pay around £1.89 per episode (or £6.99 a series) to own what they can already watch. You'll be able to watch shows bought through BBC Store via the BBC Store website or by using the BBC Store app until 1st November. You can no longer buy shows from the store. The BBC will refund anyone who bought shows through BBC Store, either in cash or with vouchers for Amazon Video. If you choose the latter, you'll get 10 per cent more than you're owed as a goodwill gesture. MORE: Amazon Prime Video vs Netflix - which is better?